The kids are going back to school, so for this week we volunteers get a little break in our schedules as the students adjust to theirs. We’ll be back to normal in a few days. For now, we’re enjoying a much needed rest, which has given me time to reflect on the complex layering of cultures in Nablus. 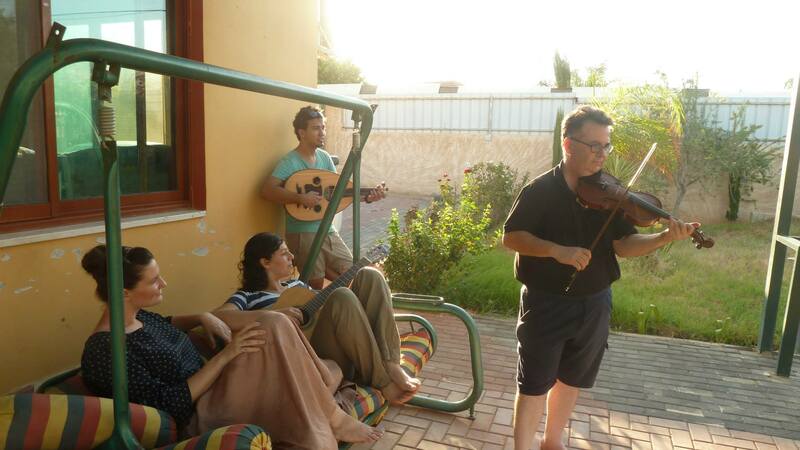 That, and also a few days to party at our friend’s pool house in the Jordan Valley. The pool house had a high fence surrounding it, so for the first time in three weeks, I was able to wear a bikini and walk around in shorts and a tank top. Note: I’m from California, where the second the weather breaks 16 °C, everyone’s in shorts. I consider it a major accomplishment that I’ve grown comfortable with long sleeves and pants in a country where people drink hot tea to cool down. I’m used to it now, but during my first week here, I was amazed that so many of the women were wearing head scarves (hijabs) in this heat, along with leggings and even jackets. To be honest, I was criticizing (in my head) the idea that this society’s religion oppressed its women in terms of freedom of movement and expression. As usual, the truth is a little more complicated than that. Abu, a friend of Nidal’s, took it upon himself to enlighten us. As we walked through the souk, looking for some knefah, Abu picked up a conversation we had started earlier about religion. “You know Muslim women don’t have to wear the hijab,” he began. I will admit, I was surprised. My mother is technically a Muslim and forgoes the hijab, but she also forgoes the rest of the religion, so I didn’t exactly view her as the paradigm of cultural Islam. “Yes, in the 1980’s, before the First Intifada, Palestine was like Europe. Tee-shirts, dresses — seriously! You should see my aunt’s pictures.” And it’s true: if you look at photos from that era, not nearly as many women wear the scarf as they do today. Abu was getting excited now; you could tell he’s explained all this before. “It’s traditional, not religious. The tradition comes from religion, yes, but people only take the tradition so seriously because of he occupation. When the IDF locked down Nablus in the early 2000s, times were hard, and we didn’t have international influence because nobody could enter the city. All we had was religion and tradition, and the people clung to it.” We’ve definitely noticed the aftereffects of the six-year blockade on Nablus; it’s one of the most conservative cities in the West Bank (not including villages), meaning long-sleeved clothes, no alcohol, and a major emphasis on religion. Pop culture and social media is huge here, but whenever Israel begins bombing the Gaza Strip, the only songs accepted on the radio are dedicated to Gaza, and Facebook becomes a channel for otherwise censored news and critique. But it’s important to acknowledge that this cultural lean towards conservatism was caused by the occupation and is a way of resisting it, rather than the reverse: that religious intolerance caused the occupation. In fact, Nablus has always been, and still is, a hub of religious diversity and tolerance. Though predominantly Muslim, Nablus houses a large Christian demographic that has peacefully existed here for centuries. Overlooking Nablus from one of the valley mountains is the Samaritan community, which has been there for nearly 2,000 years and is viewed as a sort of neutral zone (alcohol is routinely sold there, and Good Samaritan Arak is the best I’ve ever tasted). There used to be a Jewish community within Nablus as well, before the invasion. But now in their place, over on another mountaintop, sits Yitzhar, the Orthodox Jewish settlement that keeps itself separate from Nablus, but occasionally causes conflict in this otherwise peaceful city. We leaned against the wall of the cafe, eating our knefah as Abu finished his speech on culture. He wants us to understand, but he also understands us; he’s traveled around Europe with Nidal, so they have international experience and know quite a bit about our own cultures. We’re pretty comfortable with him, and he doesn’t care that we don’t wear a hijab. Actually, most people here don’t; we’re Westerners, with our own beliefs, and as long as we respect the culture of Nablus (see: not downing shots naked in the street; also: not starting a city-wide blockade that literally restricts all movement into and out of the city for six years), they will respect us. Moreover, they’ll probably invite us in for some tea and ma’amoul. This entry was posted in Palestine 2014 and tagged culture, Good Samaritan, hijab, Israel, Nablus, occupation, Palestine, Yitzhar on August 26, 2014 by cambamboutros.